The Hanauma Bay story offers two sets of ecotipping points. The first negative tip was when nearly all Hawaiian fisheries became open-access resources, with consequent over fishing. The positive tip at Hanauma Bay was that a fishing ban led to the restoration of marine life there. The second negative tip was the uncontrolled growth of tourism at Hanauma, followed by the positive tip of a comprehensive management plan and education program. The key concept in ecotipping points is that a small change can make a big difference. Ecotipping points are key points in an eco-social system that act as levers, or catalysts, to have far-reaching consequences for ecosystem health. Negative tipping points lead to vicious cycles (feedback loops) of environmental degradation. Positive tipping points work to change the vicious cycles to virtuous ones. They reverse the direction of change from environmental decline to health and sustainability. Positive tipping points are not always direct reversals of the negative ones; they are often interventions at other places in the feedback loops. Taking a long-term view of the Hanauma Bay Nature Preserve, we can discern two sets of negative and positive ecotipping points, precipitated primarily by political and economic forces. They offer valuable lessons for similar situations elsewhere. Hanauma Bay is a 101-acre, horseshoe-shaped bay near the southeast corner of the island of O‘ahu, Hawai‘i. Its steep curved walls are the remnants of a volcanic crater which formed about 30,000-40,000 years ago. The ocean breached the seaward side an estimated 7,000 years ago. Coral began to grow in the bay over 5,000 years ago, at first mainly upwards and then seaward. Nearly all types of reef corals known to Hawai‘i are found at Hanauma Bay. Hanauma Bay Beach Park provides the best snorkeling in Hawaii in the safe, calm waters protected by an offshore reef. This is the top place in the country to go swimming with fish. The small, palm-studded beach is situated in the crater of an ocean-breached volcano, making for an idyllic place to spend the day sunbathing, swimming, snorkeling or scuba diving. The white coral sand is accentuated by the azure blue water and underwater coral in the nearshore area. The bay has been called a “natural jewel” and even “one of the most spectacular natural resources in the State of Hawaii, if not in the United States and the world,” according to consultant Group 70’s environmental impact statement. It is just 12 miles east of the major tourist resort district of Waikiki. Legend has it that Aiai, the son of the Hawaiian fish god Ku‘ula, went around the islands establishing fishing grounds and teaching Fpeople to fish. He placed stones to attract certain types of fish, and to serve as altars where the first fish or two caught would be offered to the gods. When Aiai got to the island of O‘ahu, he first landed at Makapuu. Aiai then came to Oahu, first landing at Makapuu, in Koolau, where he founded a pohaku-ia (fish stone) for red fish and for speckled fish, and called it Malei. This was a female rock, and the fish of that place is the uhu [parrotfish]. The Hanauma Bay area is hot and dry, with little freshwater supply, so it was not considered suitable for agriculture and permanent habitation by the early Polynesians. But it was used as a fishing ground, as evidenced by the remnants of campfires, fishhooks and other implements in a cave used as a temporary shelter for fishermen. The islands were divided into districts, and each district had a number of ahupua‘a, a land segment generally similar to a watershed, from the mountaintop to the outer edge of the reef (or, where there is no reef, a mile out to sea). Each ahupua‘a had a konohiki, or resource manager, appointed by the chief. Like elsewhere in the Pacific, land in Hawai‘i was not considered private property, but usufruct rights were generally well defined. Also like elsewhere in the Pacific, fishing was governed by a system of rules know as kapu (tabu elsewhere in the Pacific; see also our case study on Fiji and Cook Islands. The konohiki of each ahupua‘a could forbid fishing for certain species, in certain areas, and/or during certain seasons to ensure sustainability of the resource. Certain species (e.g., moi) were reserved for the king and chiefs. Only the konohiki and the other tenants of each ahupua‘a, and their guests, had a right to fish in their appurtenant nearshore waters. During the Great Mahele—the division of land—in 1848, the land surrounding Hanauma Bay remained in the hands of the Hawaiian monarchy, and was passed down through generations to the Estate of Princess Bernice Pauahi Bishop (now known as Kamehameha Schools). It was a popular fishing ground for the royal family. Hawai‘i was “annexed” by the U.S. in 1898. The 1900 Organic Act required that konohiki fishing rights be registered with the federal government and verified in circuit court. The attorney general reported that condemnation proceedings will be undertaken first in connection with the most important bait fisheries, leaving the others to be condemned at a later date until eventually all such rights are publicly owned. Some thought was given to specifically defining the public as U.S. citizens and prohibiting fishing by aliens, since “great damage had been done to the shore fisheries by the indiscriminate fishing methods of Filipinos and other non-citizens,” but this would have negatively impacted the tuna industry. During World War II he was the only fisherman allowed to take his sampan out. He painted it white and flew American flags. The Army used to have amphibious maneuvers on Portlock Beach. When there was a school of fish in the bay, Mr. Lukela would ask them to take a detour and they usually did. In 1928 Bishop Estate deeded a 1,275-acre parcel of land, including the area around Hanauma Bay and the two neighboring promontories of Koko Head and Koko Crater, as well as part of nearby Sandy Beach, to the county government of Honolulu for $1.00, provided it be used “for purposes of public parks and/or rights of way, and for no other purposes.” The area became Koko Head Regional Park, O‘ahu’s largest county-owned park. The state has jurisdiction over the bay itself. The deed does not mention fishing rights; fisheries adjacent to government lands are generally considered open to the public. Access to Hanauma Bay improved with the completion of a paved road around the east side of the island in 1933. Roy Benham remembers that in the 1930s a bus from Kamehameha School would occasionally take students to Hanauma Bay for swimming on a weekend. They swam but did not fish. It still seemed like private property back then, says Benham. Access further improved when the city bus began stopping at Hanauma Bay, and the county government built a road from the crater rim to the beach, in 1950. Restrooms and showers were added as well. Hanauma Bay became a very popular spot for camping and fishing, snorkeling and diving. I was a boy scout and this was a very popular camping spot. We used to fish all over there. The left side, the Waimanalo side, was always full of dead coral but there was aweoweo, u`u, and upapalu that could be caught there at night. Nobody fished the "key hole," but somebody would lay net every once in a while. I think I saw oio and white weke come up from there. For our troop, us young boys learned to pa`ipa`i net there on the papa on the right of the keyhole. The right hand side, Ewa side papa, had lots of he`e. In the Ewa corner, we would pole and line in late afternoon for ahole, papio and moi. On the trail out to the point on the Ewa side, some of us learned to throw net for manini, kole and other small surgeons. You could use pole and line at night to catch kupipi on that side. The men would dunk for ulua from both points. I heard about someone using a kaka line going from point to point. Some of the braver of us would dive beyond the papa and there was uhu, table boss and po`ou but the current was real strong at times. On certain nights, when the lobster would walk, some people lay lobster nets. I can't remember if there was opihi and I don't think there was much nenue like there is now. A study of weekend visitors to Hanauma Bay in June 1964 showed an average daily count of 128 persons with diving gear, 45 with spear guns, 51 with fishing poles, 15 with throw nets, 7 with hammers or crowbars, and 3 who were bow fishing or squidding. It was estimated the weekend users removed 468 coral heads and 1,092 fish in the course of a year. By the 1960s fish populations were dwindling in all the nearshore waters around O‘ahu. This is directly related to the growth in human population (see Figure 1). The correlation is due not only to over-fishing in a population where about 1/3 of the residents fish, but also to factors such as urbanization and pollution, habitat alteration, and nearshore activities. In 1964 the head of the state Division of Fish and Game, Michio Takata, noted that Hanauma Bay,because of its configuration, would be ideal as a marine sanctuary, a “living laboratory” where people could observe a natural coral reef ecosystem. The Division drafted Regulation No. 32,prohibiting all fishing and taking of coral, seashells, sand, or rocks from Hanauma Bay. A public hearing was held on September5, 1967. Mr. Takata explained the reason for establishing Hanauma Bay as a MLCD was threefold: Hanauma Bay was (a) a very popular recreational area for observance of marine life, (b) marine life was being overly exploited and needed protection, (c) from a control standpoint, the geographical features of the bay made it suited for a marine life conservation district. The minutes of the meeting reveal that this was one of the first in a long series of conflicts between fishers and divers. Several people who had fished at Hanauma Bay for decades testified that they had observed no decline in fish populations, and no data we represented to the contrary, but diving clubs and conservation groups—along with the city parks department—won the day .Chapman Lam, who spearheaded the effort on behalf of the Hawaii Council of Diving Clubs, “cited the need to reserve an area for those who wish to observe marine life in as natural a state as possible. He also mentioned the favorable impact such an establishment may have on Hawaii’s tourist trade.” We shall see below how right he was. The fish population rapidly regenerated (see Figure 2). It is estimated that the population of fish and other marine animals grew by 600%during the first 16 years of Hanauma Bay being a MLCD. Fish biomass per hectare far exceeds that of other MLCDs (see Figure3). Also,importantly, the bay is a safe haven for endangered monk seals and threatened green sea turtles. Figure 2 -Fish population over time (pounds/acre), (Division of Aquatic Resources data compiled by Alan Friedlander). Figure 3 - Fish biomass (kg/ha) at three MLCDs and one fisheries management area, 1994-1998 (Friedlander & Brown 2004). The most recently analyzed Division of Aquatic Resources data (2001) included two surveys, one on the “Witch’s Brew” side and one on the “Toilet Bowl” side of the bay. Witch’s Brew had 1,726 pounds of fish per acre, comprising 77 different species. Toilet Bowl had 158 pounds per acre with 54 species. Combined, 20 of the species were endemic. The results of a much more detailed fish survey done in 2004 (with 80 transects) are shown in Figure 4. Ninety-one different species were found in the bay, with the palenose parrotfish (uhu)being #1 on the Index of Relative Dominance (percent frequency x percentage of total biomass). There are over eight times as many fish inside the bay as outside of it. Reef fish tend to have high “site fidelity,” but there are some species that move in and out. The spillover effect—that is,the value of additional fish in neighboring waters on account of establishing a MLCD—was estimated by van Beukering and Cesar at $2,500 per year, based on a range of $0 to $5,000 in similar areas elsewhere. Ironically, the positive tip of restoring fish populations led to a negative tip of overuse. Hanauma Bay became essentially a giant natural aquarium, a “must-see” for the rapidly growing number of Waikiki tourists. Over 80 private tour and dive shop operators brought groups to the bay, in addition to snorkeling groups from the University of Hawai‘i and county parks department. Commercial tour buses dropped off an average of one busload per minute during peak periods.In the summer, the County Department of Parks and Recreation brought large groups of local “Summer Fun” children to enjoy splashing in the shallow waters. “The Parks Department was one of the worst abusers,” recalls current Hanauma Bay Director Alan Hong. “We were using the hell out of it.” Hong was the Park Department’s Ocean Recreation Specialist from 1975 to 1990. He taught canoeing, windsurfing and snorkeling in the bay. By 1988 the visitor count had grown to 3 million per year. A number of problems arose. People parked in grassy and unvegetated areas, causing soil erosion.They parked along the highway and in nearby neighborhoods. They relieved themselves in the bay instead of waiting in long bathroom lines, which perhaps made little difference since the cesspools were overflowing. Water quality was further impacted by fish feeding, as visitors dropped an estimated half ton of bread and many bags of frozen peas into the water every day to attract fish (who, of course, also relieved themselves in the water). Suntan lotion added to the “soup.” Encouraged by the nutrients, seaweed spread from the old bathhouse area outward to the reef. The reefs were badly trampled by people. Garbage cans were overflowing, and litter was strewn around the beach. The 1970s saw a large number of letters to newspaper columns such as “Ms. Fixit” and “Kokua Line” complaining about these problems. In 1978 the county suggested to the state that commercial use of the bay be limited. To the dismay of dive shop operators, in 1979 the road to the beach was closed to all vehicles except a shuttle service. Commercial activities were halted entirely in1981, after the county was fined $2,000 by the state for allowing commercial activity in a public park, which is generally prohibited. Rules governing the matter were reconsidered to create a reasonable park enterprise permit process. It was suggested, for instance, that no more than 130 divers at a time could be present from commercial tours. The dive shops formed an organization to protest the restrictions; many businesses folded entirely or lost up to 80 percent of their income during the ban on commercial activity. In 1983 the University of Hawai‘i Marine Option Program and Sea Grant Extension Service sponsored a symposium on Hanauma Bay. Eighteen speakers discussed the natural history of the bay and its worsening overuse and degradation. It was also noted that Hanauma Bay had great potential as a multi-disciplinary educational resource. The real turn around came in 1990. In that year, the county adopted a new management plan for the park; the University of Hawai‘i Sea Grant College Program began developing a marine education program; and an article in the newspaper led to the formation of Friends of Hanauma Bay, a community group dedicated to preserving the bay. These three entities formed a “unique partnership” to establish the Hanauma Bay Education Program. Parking regulations along the highway are strictly enforced. Commercial tour buses are only allowed in the designated commercial parking lot, and only for 15 minutes so their passengers can look at the bay from above and take pictures. Taxis are allowed to drop off people, but only if they are metered and carry fewer than eight passengers. Commercial scuba and snorkeling companies require permits, and there are only 21 of these. They are not allowed on weekends and holidays. Other commercial activities are limited to a snack bar, a gift shop, a snorkel gear rental stand, and the shuttle bus. A $5 admission fee is charged; the fee is waived for Hawai‘i residents and any children under the age of 13. Some unscrupulous tour companies circumvent the regulations by dropping off busloads of tourists at a nearby shopping center, then shuttling them—equipped with snorkel gear—by “taxi” (actually, 10- to 12-passenger vans) to the bay. The county can enforce the rules that taxis be metered and hold fewer than eight people, but enforcement is less than diligent. Nevertheless, the visitor count dropped from 3 million in 1988 to about 1 million per year today, with a concomitant decrease in the above-mentioned environmental problems. Water quality further improved when the cesspools were abandoned and replaced with a connection to the nearest sewage treatment plant in the early 1990s. The algae retreated. Smoking on the beach was banned in 1993, and fish feeding was banned in 1999. This led to a small decline in the overall fish population, and a shifting of certain species (e.g., nenue) back to the outer face of the reef. The Hanauma Bay Education Program, administered by the University of Hawai‘i Sea Grant College Program, initially had only a small office on the upper level and an information table set up on the beach, staffed by volunteers, to inform people about taking care of the reef. Educational programs for groups of schoolchildren were primarily conducted outdoors. Sea Grant (a federal/state partnership) was the primary funding agency for the program from 1990 to 1997. Then the County Department of Parks and Recreation began underwriting the program through a contract with Sea Grant. A 15-minute orientation video for all beach visitors,translated into seven different languages via special earphones. It tells of the history and geography of the area, the great diversity of marine life in the bay, and the importance of water safety. But the main message is to respect the reef ecosystem. (Alan Hong estimates that the percentage of visitors standing on the reef has declined from 49% to only 2%.) The video also serves to regulate visitor traffic, as a maximum of 125 people are released from the theater every 15 minutes. A summer college internship program and a week-long summer marine education program—in collaboration with Waikiki Aquarium—for middle and high school students. An entity to serve as the “voice of the community” in dealing with issues of preservation at the state and county levels. In particular, the group has lobbied for better enforcement of the taxi rules. Apart from restoring the “natural jewel” of Hanauma Bay, spin-off effects include dispersion of tourists to other parts of the island. Hopefully, too, their education at the bay will lead to respectful behavior toward reef ecosystems elsewhere in the world. The Hanauma Bay management plan and education program also serve as a model that could be replicated in other places with similar issues. Ako, Diane. 2005. “Alan Hong: Guardian of the Bay.” Makai, 1(8), p. 12-17. Anonymous. 1940. “Ban Placed On Private Fisheries.” Honolulu Advertiser, September7, p. 1. Anonymous. 1947. “Condemnation Of Konohiki Fishing Asked.” Honolulu Advertiser, April 10, p. 6. Anonymous. 2007. “Pacific Miracles.” New York Times, April 21. Brock, Richard and Alan Kam. 2000. Carrying Capacity Study for the Hanauma Bay Nature Preserve – Final Report. Prepared for the Honolulu Dept. of Parks and Recreation. City and County of Honolulu, Department of Parks and Recreation. 2004. “Hanauma Bay History.” (“Text courtesy of John Hoover from his book Hanauma Bay, a Marine Life Guide”). Website http://www.honolulu.gov/parks/facility/hanaumabay/history.htm. Department of Business and Economic Development, State of Hawaii. 1990. Report to the Fifteenth State Legislature Regular Session of 1990 on Chapter 228, Hawaii Revised Statutes Ocean Resources Management. Department of Land and Natural Resources, Division of Fish and Game, State of Hawaii. 1967. “Minutes of the Public Hearing” (September 5). Department of Land and Natural Resources, Division of Aquatic Resources, State of Hawaii. 1952, 2001. Fish survey data sets for Hanauma Bay. Department of Land and Natural Resources, Division of Aquatic Resources, State of Hawaii. 1988. Main Hawaiian Islands Marine Resources Investigation 1988 Survey. Friedlander, Alan and Eric Brown. 2004. “Marine protected areas and community-based fisheries management in Hawaii.” P. 212-236 in Status of Hawaii’s coastal fisheries in the new millennium, edited by A.M. Friedlander. Proceedings of a symposium sponsored by the American Fisheries Society, Hawaii Chapter. Honolulu, Hawaii. Friedlander, Alan, Eric Brown, Mark Monaco, and Athline Clark. 2006. 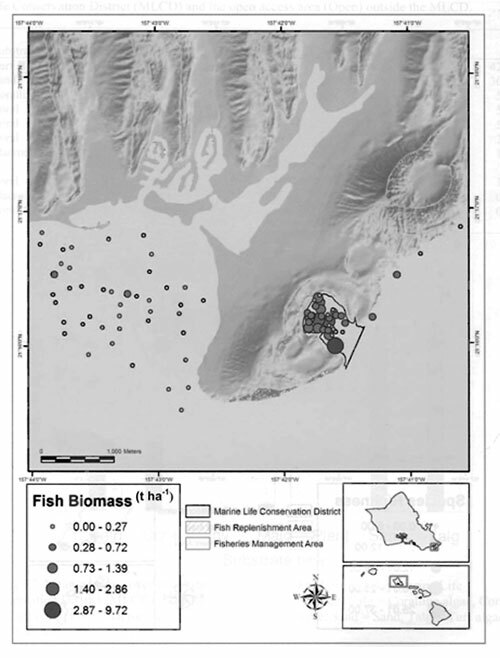 Fish Habitat Utilization Patterns and Evaluation of the Efficacy of Marine Protected Areas in Hawaii: Integration of NOAA Digital Benthic Habitat Mapping and Coral Reef Ecological Studies. NOAA Technical Memorandum NOS NCCOS 23. Group 70 International, Inc. 1999. Improvements to Hanauma Bay Nature Preserve Final Environmental Impact Statement. Honolulu, Hawaii. Hong, Alan. 2007. “How good were the ‘good old days’?” Nanamoana (Friends of Hanauma Bay newsletter), July. Iversen, Robert, Tom Dye, and Linda Paul. 1990. Native Hawaiian Fishing Rights. A Report Prepared for the Western Pacific Regional Fishery Management Council. Kaneohe, Hawaii: Pacific Fisheries Consultants. Kosaki, Richard. 1954. Konohiki Fishing Rights. Report No. 1. Legislative Reference Bureau. Krauss, Bob. 1966. “Mr. Lukela of Maunalua Bay: A Fisherman—and An Era—Die.” Honolulu Advertiser, March 27, p. 8. Lam, Chapman. 1969. “Hanauma Bay: Hawaii’s First Underwater Park.” Skin Diver, November, p. 53-60. MacKenzie, Melody Kapilialoha (ed.). 1991. Native Hawaiian Rights Handbook. Native Hawaiian Legal Corporation. Nakuina, M.K. (translated from Moke Manu). 1907. “Aiai, Son of Ku-ula.” Chapter XXII in Hawaiian Folk Tales: A Collection of Native Legends, edited by Thomas G. Thrum. Chicago: A.C. McClurg. (reproduced 2006 as a Project Gutenberg Ebook #18450 [link http://www.gutenberg.org/files/18450/18450-8.txt]). Natarajan, Prabha. 2005. “Waves of dissent hit Hanauma Bay.” Pacific Business News, May 13. Natarajan, Prabha. 2005. “Taxis at Hanauma Bay get a taste of city enforcement.” Pacific Business News, May 27. Shomura, Richard. 1987. “Hawaii’s Marine Fishery Resources: Yesterday (1900) and Today (1986).” National Marine Fisheries Service Southwest Fisheries Center Administrative Report H-87-21. Tsutsumi, Cheryl Chee. 2005. Hanauma Bay: Hawai‘i’s Coastal Treasure. Waipahu: Island Heritage Publishing. University of Hawai‘i Marine Option Program and University of Hawai‘i Sea Grant Extension Service. 1983. Hanauma Bay, Hawaii, symposium. University of Hawai‘i. University of Hawai‘i Sea Grant College Program. n.d. “The Hanauma Bay Education Program.” Brochure. van Beukering, Pieter and Herman Cesar. 2004. “Economic Analysis of Marine Managed Areas in the Main Hawaiian Islands.” Cesar Environmental Economics Consulting. Workinger, Valerie. 1988. “Management Considerations for the Hanauma Bay Marine Life Conservation District.” M.A. Thesis, University of Washington.